A hot appendix is keeping Dead & Company from playing their show tonight in New Orleans. Early this morning, Tuesday, December 5th, John Mayer was admitted into the hospital for emergency appendectomy forcing the Dead & Company December 5th concert in New Orleans to be postponed. All tickets for the December 5 show will be honored for the rescheduled date. Information on the rescheduled date will be announced as soon as possible. Should ticketholders choose to seek a refund, they will be available at point of purchase. 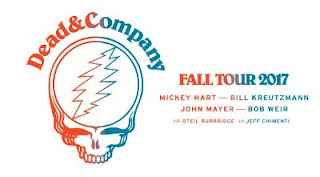 Dead & Company, made up of Mickey Hart, Bill Kreutzmann, Bob Weir, Mayer, Oteil Burbridge and Jeff Chimenti, announced their first tour less than two months after the Grateful Dead played their final show. They've been going strong ever since. The question of how fast Mayer can heal after the surgery, which is now normally done arthroscopically instead of as a major operation, will determine if their last two dates on this tour will go off as planned. They are scheduled to play in Orlando on Thursday and Sunrise, FL on Friday.